This is a project that I have been meaning to start from the first day I began this blog, but have not had the time nor the clarity of idea to get it done. What is presented here is my first attempt at the ‘Die of the Week’ series. I would very much like to hear your suggestions for improvement, and other statistics that might be useful. Although it is called Die of the Week, please do not expect me to be able to produce these articles at this frequency. If someone out there would like to take this on as a project, please let me know. Over the coming weeks, I intend to give, what I believe to be, useful statistics and tactical suggestions for the use of a wide variety of dice used in the game. This will eventually include Terrains, Dragons, Artifacts and loads more. For now, we make a start with one of my favourites, the Selumari Sharpshooter. Below are the success statistics for the Sharpshooter compared to all other 3 health units that carry the Bullseye SAI. On the saves table I have included the Coastal Dodge on the Saves statistics (marked with an asterisk). 66% of results should fall between the 66 Lower and the 66 Upper figures. 95% of results will fall between zero and the 95 Upper figure. NB – The 4X entry on the missile table refers to the Bullseyes, which are not included as missile results, but are treated separately. Click on the tables to enlarge. The beauty about the Bullseye Special Action Icon is that, not only does it do missile damage to a single enemy unit, so that a particularly dangerous opponent can be targeted in the largest of armies with a reasonable amount of success, but it also gives another die roll, which continues until no Bullseye is rolled. The Bullseye SAI works against a single unit in the opposing army and therefore totally disregards and defensive spells or other effects that are cast on the army or terrain containing that unit. 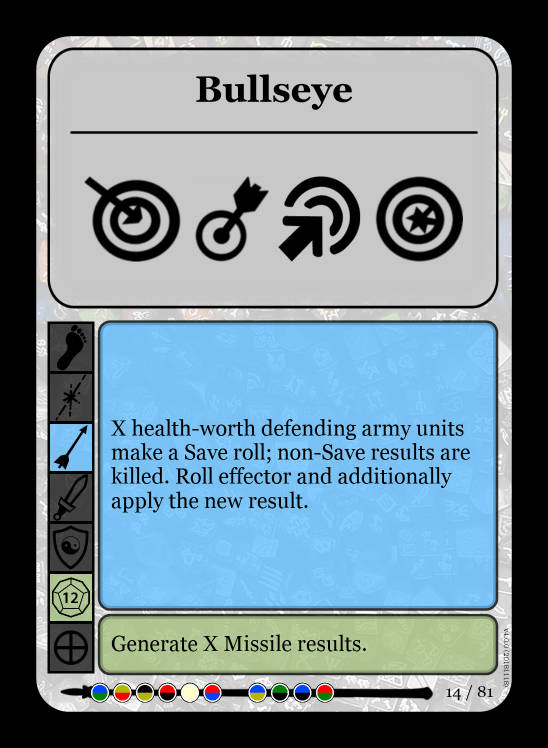 It also means that only the unit itself can roll for saves, irrespective of how many saves can be generated by the containing army. If your opponent is know for stuffing their army with Eldarim Shield Bearers and casting loads of defensive spells, this gets over all of that and allows you to attack the units that are causing you problems. The only downside, obviously, is that it is not very effective at taking out Shield Bearers, but they have very little attack capability any way, so this should not matter too much. The fact that, after applying the Bullseye SAI, the Sharpshooter is re-rolled means that this result is also added to the generated missile damage. If another Bullseye is rolled, the SAI action is resolved again, and the die is rolled again, and so on until no Bullseye is rolled. Theoretically, this means that the Sharpshooter can dish out an infinite amount of damage (by continuing to roll Bullseyes). In practice, however, the probability of doing this is extremely small. The probability of getting the first is 1/6 (16.67%), of getting two consecutively is 1/36 (2.77%), of three consecutively is 1/216 (0.46%) and so on. The probability of this happening is included in the Expected value and Standard Deviation calculations above. If multiple Sharpshooters (or other units in the above list) are used, the probability of a Bullseye increases as shown in the table below. As can be seen in the table, if 3 Sharpshooter are in an army, 34.72% of the time they will generate a bullseye, 6.94% of the time they will generate 2 bullseyes and, if you have patience, 0.46% of the time they will all hit bulleyes simultaneously. This means that with 3 Sharpshooters, there is a 42.13% chance of generating at least 1 bullseye per die roll. The probabilities for 4 Sharpshooters up to 8 can also been seen in the table. As the Coastland terrain gives all the Racial Benefits available to the Coral Elf (Selumari) race, it is important to not that faces 2, 3, 4 and 5 are missile faces. This gives a 66.67% chance of the starting face being beneficial to the Sharpshooter. With the Defensive Volley racial ability, the Sharpshooter gets to fire back at any missile attack when stationed at any terrain containing the air element (blue). This is severely good form of defense. Who, but a novice player, is going to attack a Selumari army with 3 Sharpshooters with missile fire, if they are aware that they could immediately be on the receiving end of up to 3 bullseyes? As the Bullseye is not an ID, it counts when used from an 8th face Tower against reserve armies. This is particularly good against races that rely on terrains to convert manoeuvres to saves, such as the Selumari arch-enemy, the Lava Elves.